Amalgamate the blend of unconfined creativity and loved moments with these unique art works. Design your wall with your own personalized photo posters! Create your custom coaster with personalized photos or texts. Let your photo speak with stunning 3D Picture Frames. 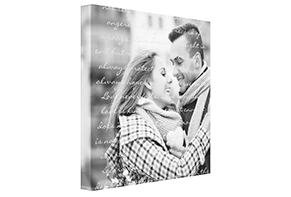 Create a beautiful personalized photo blankets with your favourite pictures. Photo Print your best memories of life. Make your photos look professional with us! While music takes you to an altogether new world, the verses of a tune can lead you to feel what you've been hiding from people around you. 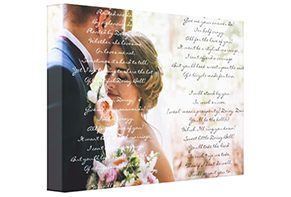 Express those feelings utilizing our personalized lyrics on canvas prints. Is there a melody that is far excessively near your heart? Be it the minutes when we feel dull or those in the midst of the gathering light. We have a melody for relatively every articulation. A tune that is near our heart and portrays our feelings in the most charming way. 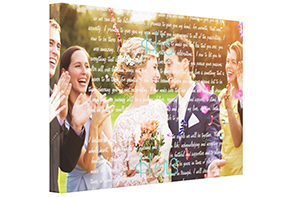 The custom verses on canvas prints made at CanvasChamp benefit you with a scope of alternatives to make your customized verses on canvas prints. 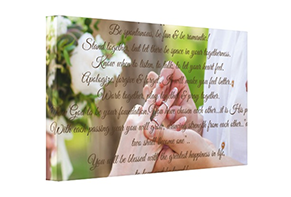 Every verse on canvas prints is stuffed with most extreme security to guarantee it achieves your doorstep with no harm. Not just the outline, you can likewise tweak it according to your financial plan and the size you need. If you aren't totally happy with the print you get, we’ll do everything to serve you the best. At any point if you wish to have some guidance, our experts would love to guide you. The dedicated design tool lets you customize your lyrics prints without any hustle. Before you present your last outline, you find the opportunity to verify your advanced print before you present your request. 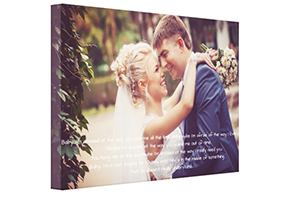 Printed under the supervision of specialists and made by experienced craftsmen, you can remain guaranteed of having best verses on canvas printing. For each question that you share with us, we flourish to convey a provoke reaction. The day is without a doubt among the most extraordinary part of your life. You can't just give the memories a chance to blur with time. 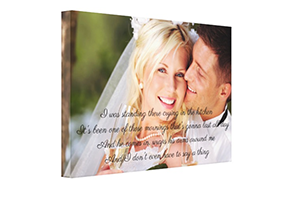 Give them the fragrance of rapture with our wide range of personalized wedding lyrics canvas prints. Here are answers to questions you might have. If you don't find your answer below and still need assistance, please contact our Customer Service. 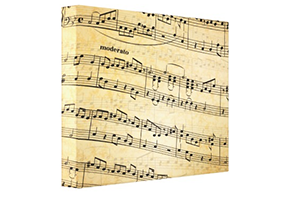 Can I customize/personalize my canvas prints? Undoubtedly you can. Choose the canvas size, colors, type and much more. 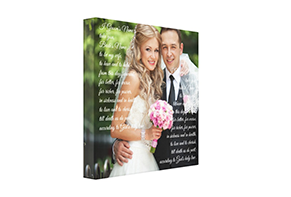 In fact, you have all the rights to decide how your wedding canvas print should look. How long does it take to receive the canvas? On an average, it takes somewhere between 3-10 days to deliver your canvas print securely and in a ready to hang condition at your doorstep. Can I send you my personal photo and text/lyrics/wedding vows? 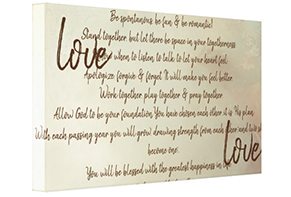 Our canvas prints avail you full liberty to personalize your canvas. Also, we ensure that you don't find it difficult to do so. This is why we empower you to upload your photo and text/lyrics/wedding vows while placing the order directly from your laptop or import them from your social media accounts. Sounds interesting!! Isn't it? We have designed the order placement process as simple as possible. You start with importing your pictures and sharing the content. 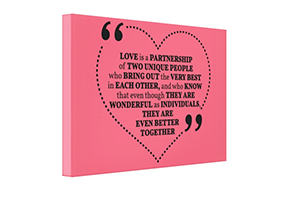 Followed by this you choose the size and type of canvas print and make necessary editing or add effects to your canvas. And lastly, you get a digital file to cross check how your canvas will look. Are you providing proofread options or demo of my products? Yes, we do. 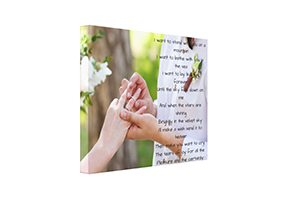 To ensure that your final order gets adorned with perfection, we allow you to proofread the digital format of your canvas print. That will give a sneak into how your final print will look like. 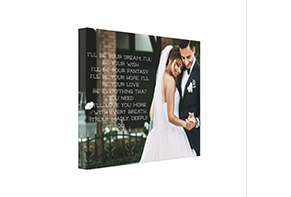 Transfer your beautiful photos to the highest-quality canvas, metal, and acrylic glass prints for your home or office, choose from our wide range of sizes and styles and make perfect photo gifts! We are offering fast, affordable, high-quality prints in Auckland, Wellington, Christchurch, Hamilton, Dunedin and all over New Zealand. Celebrate the exclusive moments of your life with CanvasChamp.